From left to right: Donna Balkan (2012 champion), Paul Van Bloem, Sam Packwood, Roderick Lee, and John Henry. Picture above and account below courtesy Ron Secunda. 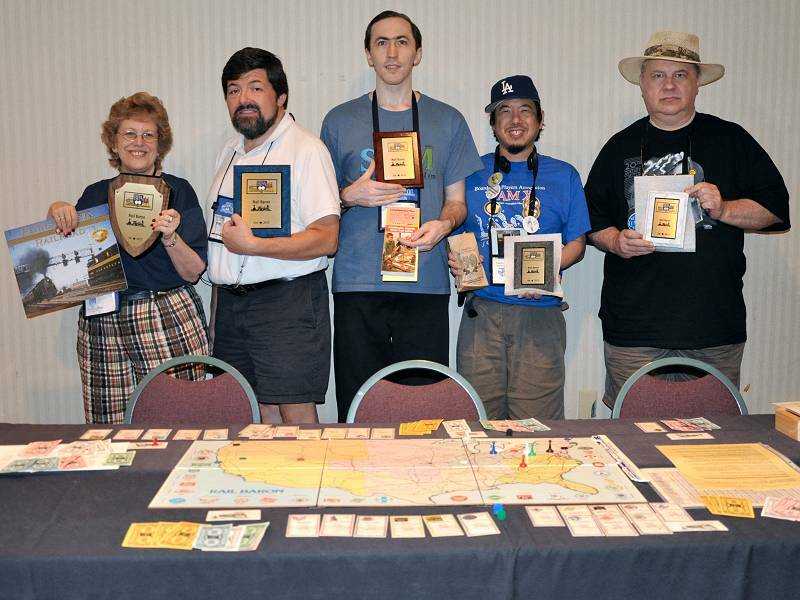 Yet again, a dedicated group of Rail Baron players turned out to play a game that has not been in print for many years. And, once again, one of our Canadian neighbors went home with the "Gold". My personal congratulations go to Donna Balkan. I won't mention how long Donna has been pursuing this prize; I'll just say that persistence finally paid off. I constantly remind our players to check the kiosk to see if they may have qualified as an alternate to play in the Semi-final game and/or the Final. This year, three players did not show up for the Semi-final and were replaced with alternates, and one Semi-final winner did not show up for the Final game. The first alternate, who was then seated at the Final, was Assistant GM Paul Van Bloem. Paul captured the first alternate position due to his winning two first-round-heats, the only player to do so this year. However, none of the next three alternates that had been listed were around for the start of the Final. I understand that our five Semi-final winners practically always show up ' but not this year. It reminds me of my very first Semi-final game. I didn't bother doing the 1-hour drive up to Hunt Valley the following day,thinking it would be a waste of time. Unfortunately, I could have played in the Final (a word to the wise). Congratulations also, to our other Finalists. Donna's final RR holdings were: NYC, UP, CB&Q, WP,GM&O, and B&M. All were her own purchases, except for the WP, which she bought at an auction when John Henry ran out of money coming out of a hostile Cleveland. John, who brought the "Gold" home to Ontario in 2010, just didn't fare as well in this game. He was initially plagued with short runs (between the NE, NC, and SE), eventually reaching a total of 24 destinations (six more than anyone else), 14 of which were hostile. John ended up auctioning off practically all of his purchases (WP, C&O, T&P, IC, and SAL), and at the end of the game, held only the IC. Paul began his run for the second-place winner's spot by purchasing the PA, followed by the NP, SP, MP, N&W, and RF&P. Paul was able to secure John's SAL at auction, just barely out-bidding Sam Packwood for it. Sam, who finished third, started his purchases with the D&RGW, B&O, GN, C&NW, CRI&P, ACL, and SOU. Sam added to his RR holdings by buying John's T&P at auction. Roderick Lee started his collection with the NYNH&H, followed by the AT&SF, CMSTP&P, L&N, and the SLSF. Roderick initially seemed to have a good start, but, by game's end, he had traveled to 10 hostile destinations out of 18. After purchasing the SLSF, he was forced to auction off his NYNH&H, which Paul happily added to his collection. However, Roderick later secured John's C&O at auction. By comparison, Donna traveled to only three hostile destinations, Sam four, and Paul five. Toward the end of the game, Donna completed runs from Philadelphia to Portland, OR, to Los Angeles, to New York City, to San Francisco, and then back across the country to Boston, where she declared for her Home city of Pittsburgh. Her ending totals of RRs and cash were: $331.5. Paul's: $363.5, Sam's: $298, Roderick's: 223.5, and John's: $31.5.